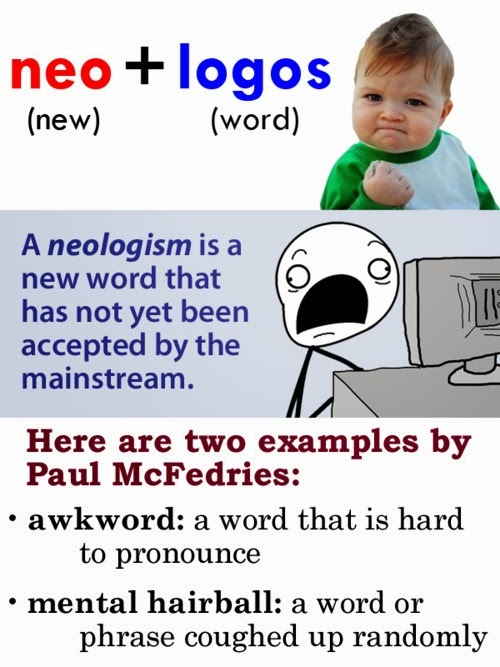 A neologism is the name for a newly coined term, word or phrase that may be in the process of entering common use but that has not yet been accepted into mainstream language. Neologisms are directly attributable to a specific person, publication, period, or event. Neolexia (new word, or the act of creating a new word) is a synonym for it. The term neologism is first attested in English in 1772, borrowed from French néologisme (1734). A neologosm may also be a new usage of an existing word, sometimes called a semantic extension. This is distinct from a person's idiolect, one's unique patterns of vocabulary, grammar, and pronunciation. DO YOU WANT TO LEARN NEOLOGISMS? Click HERE and you'll learn new words everyday!! When you learn a new word, you start seeing it everywhere!! Don't miss any word in your life! !